Well, I was checking out the new wowhead talent calculator and trying to figure out a way to shave enough points out of the Ret Tree to keep a 30 second stun. Well I may have found it. So let's look at what's missing from my tree. SOC - Yep, Seal of Command is gone, the word from PTR folks is that because judgments count for a lot less damage, the blowback from Seal of Blood/Martyr is reduced greatly making this better for all around Damage. If there's an instance where you absolutly can't be taking damage, then you can always dust off that old Seal of Command or even go to a holy seal. 2H Weapon Specalization - Well, this was gone a long time ago for me. So not putting it back doesn't hurt. Improved Blessing of Might - There it is... the two point loss that (if anyone coments) people will be looking at hard. 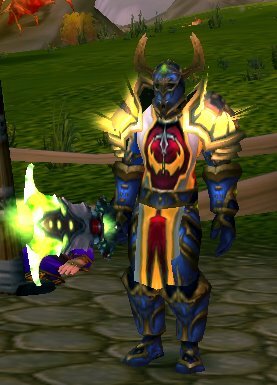 I hate running numbers and I don't even have time for it right now, but my thought is wtih BOK trainable, a ret pally will be OK using BOK instead of BOM on himself. Sure there is less AP, but you get more health, more mana, bigger crit to make up for it. And you suddenly buy youself 2 spare points to get the 30 second CD for Improved Hammer of Justice and keep Divine Guardian which will just be huge. The excellent blog RET PALLY SMASH has put up a different build 0/20/51 You get basically the same Prot tallents, but the ret tree gives up RV and Fanaticism instead of BOM and 2H weapon damage. Here's the thing, Ret Pallies are getting their burst reduced already, RV and Fanticism work great together to help keep the burst up. 18% extra chance to crit AND when the crit happens 30% will be a DOT. Is that better then 6% white damage... Yes I think it is. Is it worth not having improved BOM? Only a little real world testing or heavy theorycrafting will tell. I am definitely going to have to play with these in front of a target dummy. wtf? What baddie made this? divinity and imp devo aura gives a lot more on instant flash heals, use at opertune times and you have lots of survivability. Well, first of all there isn't "A" retri PvP spec, since your spec depends on the combo you wish to play and yoour style of playing. And I'm speaking at arenas, not BGS. If you're planning to play with a healer, you might disregard your auto healing habilities and concentrate on max damage. If you go for a DPS combo (pew pew) you might want to improve your survivibility in spite of pure DPS. No to Righteous Vengeance: although it improves your damage, it breaks CC and you can't control it. It might proc when your partner is casting sheep or blind, for instance. and 30% damage over a 8 sec period isn't that much damage worth breaking a CC. Yes to SoComm. SoComm > SoV/SoCorr. It does a decent amount of instant damage, with the right Libram it improves your AP, with the right glyph procs very often and its not dispelable. Besides, retri is all about bursting damage.